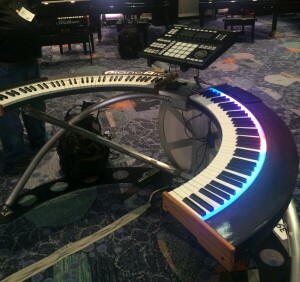 Our latest design, dubbed DualWing, debuted at NAMM 2016 – and wowed the crowd with a totally new approach to keyboard layout and stand design. This semi-custom unit is heading for the Atlanta Hawks NBA team’s Phillips Arena, where it will become the official stadium keyboard for in-house artist, Sir Foster. and help deliver a new standard in stadium entertainment along with the Hawks famous light and video show. This new design features dual 72 note controller keyboards with synth action, a carbon fiber top, integrated (midi-programmable) light show, custom machined aluminum stand and custom mounts for control surface, laptop and additional mic mounts. NAMM featured a visit by the Hawks personnel, including Sir Foster, with footage, photos and video that will become part of the Hawks show. After seeing and trying the keyboard for the first time, Sir Foster proclaimed “This PianoArc is everything I dreamed it would be and more”. This is brand-spankin’ new – so if you’d like more info, give us a quick shout via our quote request form. 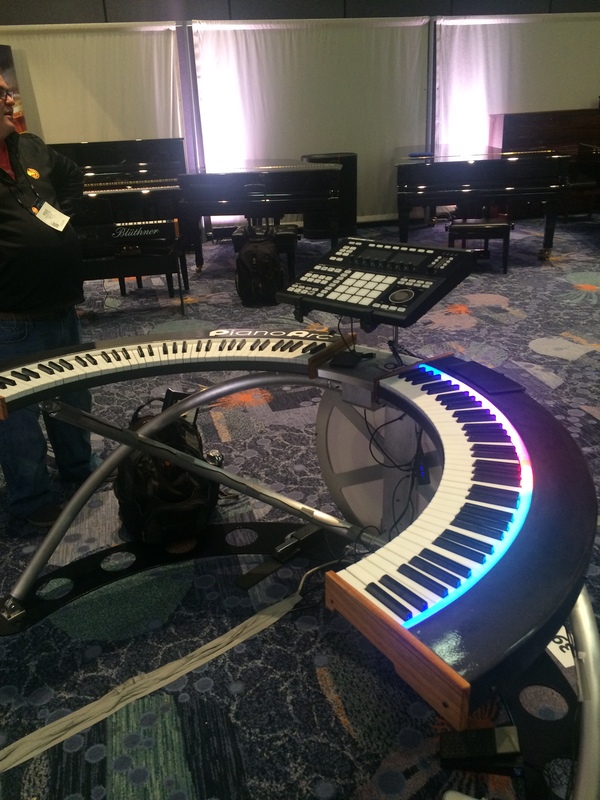 PianoArc debuts the Dual Wing design at NAMM 2016. 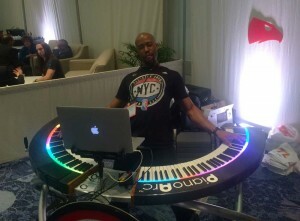 Featured here with Native Instruments Maschine control surface. 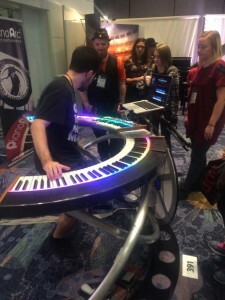 Berklee student, Asher Denburg demonstrates the PianoArc Dual Wing at NAMM 2016. Killin’ it! 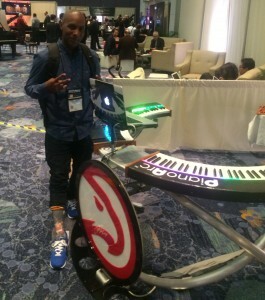 Hawks Fan at NAMM 2016 – showing off some cool socks!